Does mention of the Prilezhaev reaction leave you baffled? Ever wondered, "Just what IS the mechanism of the Kulinkovich cyclopropanation?" 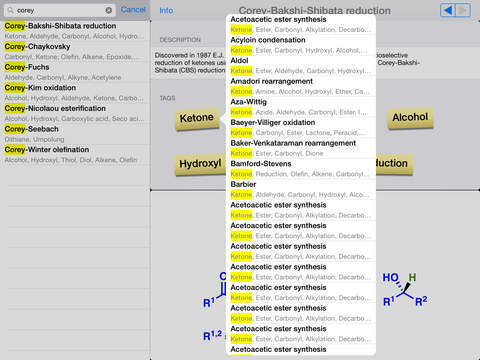 Wished that you could remember the structure of the Schwartz reagent? 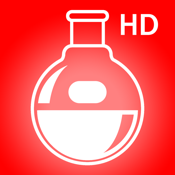 Named Reactions Pro HD contains details on over 300 organic reactions, from the acetoacetic ester synthesis to the Zincke reaction. 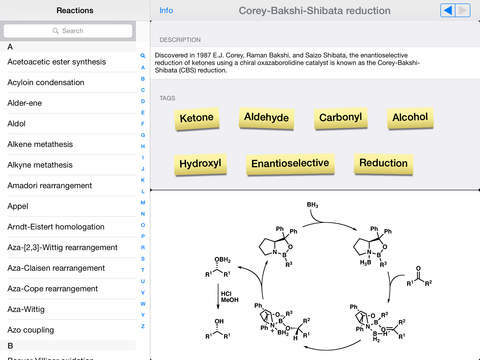 Reactions are fully indexed and searchable, and each reaction includes a description, tags, related reactions, reaction scheme, carefully depicted mechanism, and links to internet and print resources, including Wikipedia, ChemSpider, and Organic Chemistry Portal. 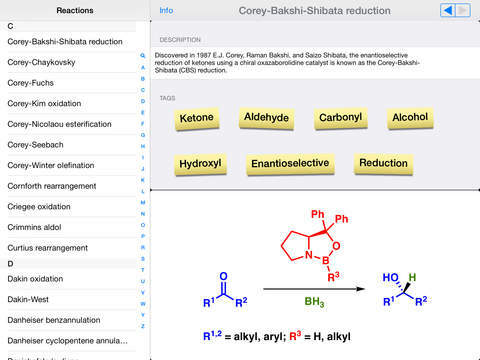 If you would like to try out all of these features for free, download Named Reactions Lite HD, which contains a subset of the reactions available in this Pro version. Note: this app has been optimized for iPad; Named Reactions Pro for iPhone and iPod touch is also available on the App Store.